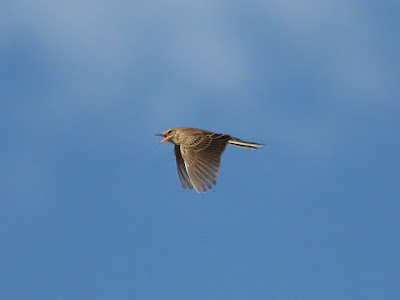 A RICHARD'S PIPIT was found early afternoon on waste ground at Scarborough Business Park, Seamer, near Taylor Way, opposite the NFU Mutual building. It remained in the area throughout the day but rarely showed on the ground. Also in the area around Taylor Way were 11 Jack Snipe (an area record), 11 Snipe, 45 Meadow Pipit, 5 Goldcrest and 3 Lesser Redpoll. Elsewhere a juvenile Marsh Harrier flew southwest over Potter Brompton Carr where there were also 2 Wigeon, 11 Teal, 1 Jack Snipe, 8 Snipe and 2 Brambling. In the Harbour there were 8 Purple Sandpiper roosting.